With great interest we read the paper by Dotti et al,1 who identified a set of differentially expressed genes in epithelial organoid cultures (EpOCs) derived from patients with UC compared with EpOCs from healthy controls. Similarly, we created an EpOC library from patients with UC (n=17), Crohn's disease (CD, n=12) and healthy controls (n=10). First, we assessed the potential of isolated intestinal crypts to grow into organoids (colony forming units). We observed that a similar percentage of organoids was formed from intestinal crypts isolated from controls and patients with UC or CD. Moreover, intestinal crypts isolated from macroscopically inflamed and non-inflamed tissue had similar potential to form organoids (figure 1A). Although we used a slightly divergent differentiation medium,2 the expansion and differentiation capacity of our organoids was similar as demonstrated by Dotti et al. (A) Colony forming units (CFUs) determined by quantification of the number of seeded crypts at the day of isolation and organoid formation after 7 days. CFUs are expressed as a percentage of organoids representative to the original number of seeded crypts. (B) Relative mRNA expression levels of leucine-rich repeat-containing G-protein coupled receptor 5 (LGR5), mucin2 (MUC2) and protein atonal homologue 1 (ATOH1). mRNA levels were normalized on the geometric mean of RPS14, HPRT1 and B2M and expressed as log values. Statistical analyses were performed with Mann-Whitney U test, (*p<0.05). CD, Crohn's disease; dEpOC, differentiated epithelial organoid culture; EpOC, undifferentiated epithelial organoid culture. UC, ulcerative colitis. Next, we characterised the organoids through mRNA expression (quantitative PCR). Expression of genes involved in stemness and proliferation (LGR5, PCNA), differentiation into the downstream lineages (ALPI, VIL1, CHGA, MUC2) and tight junctions (OCLN, TJP-1) was similar in undifferentiated EpOCs from patients with IBD and controls. However, differentiated EpOCs (d-EpOCs) of patients with CD were characterised by decreased mRNA levels of MUC2 compared with patients with UC and controls (p=0.04 and 0.046, respectively, figure 1B), while the other examined genes showed similar expression profiles between controls and patients with IBD. 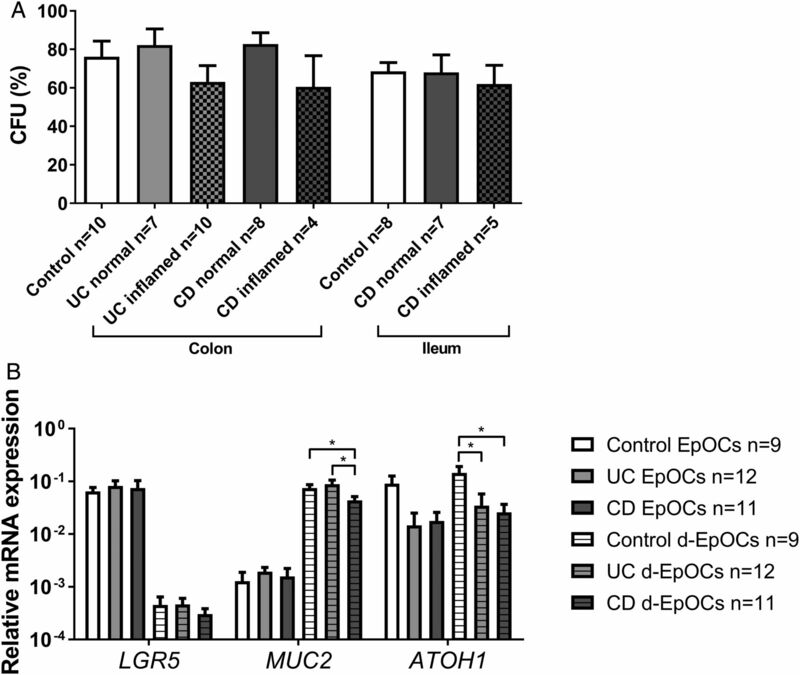 In addition, the expression of ATOH1, a transcription factor controlling differentiation into the secretory lineage, was decreased in EpOCs of patients with CD or UC compared with controls. Hence, we re-evaluated the authors' publicly available microarray data and noticed, in line with our findings, a significantly lower ATOH1 expression in UC d-EpOCs compared with non-IBD controls (p=0.007). Dotti et al confirmed their findings in a second cohort of intestinal biopsies from non-IBD controls, patients with UC in remission or with active disease. Expression of LYZ, and CLDN18, was upregulated in inflamed tissue, but not in tissue derived from patients with UC in remission. An important remark which we feel was not addressed by the authors, is the fact that inflamed tissue may quickly lose its inflammatory conditions once the trigger of this process has been resolved. Therefore, we compared intestinal biopsies and EpOCs derived from both inflamed and non-inflamed areas from the same patient. We found that the expression of interferon γ (IFNγ) and interleukin-1β (IL1β) was lower in EpOCs compared with the original biopsies used to form these EpOCs (figure 2). Strikingly, in the authors' microarray dataset, a trend for lower expression of IFNγ (0.94-fold change, p=0.012) in UC EpOCs compared with controls was observed, but these were patients with mostly no inflammation (six with Mayo 0 and two with Mayo 1). These data indicate that an inflammatory status at the mRNA level in mucosal biopsies may not be propagated to organoid cultures, and a stimulus is needed for continued expression of several markers. Recently, Hibiya et al3 showed that 60 weeks of continuous exposure of murine organoids to a mixture of cytokines and bacterial components led to induction of the nuclear factor-kappaB pathway, which remained elevated 11 weeks after withdrawal of the inducing components. Relative mRNA expression levels of interferon-gamma (IFNγ) and interleukin-1β (IL1β). Organoids were grown from normal and inflamed mucosal biopsies, and RNA was extracted from EpOCs (undifferentiated epithelial organoid cultures) after 2 weeks in culture, as well as from original biopsies. Quantitative PCR was performed to quantify the expression of genes involved in inflammation. mRNA levels were normalized to three reference genes and shown as log values. Statistical analyses were performed with Wilcoxon matched-pairs signed rank test for matched pairs or Mann-Whitney U test (*p<0.05). CD, Crohn's disease; UC, ulcerative colitis. In conclusion, the data obtained in our cohort of intestinal biopsies and organoids are in line with the observation of Dotti et al. We therefore agree that the organoid model is a reliable tool for exploring the molecular basis of IBD. However, whether transcription profiles of cultured organoids will remain identical on the long term to those of the tissues of origin remains to be further elucidated. Contributors MN: conception and design of the work, acquisition, analysis and interpretation of data, manuscript writing. BV: data analysis, manuscript writing. MdB: conception and design of the work and manuscript writing. GVA: acquisition, manuscript approval. SV: acquisition, manuscript writing, manuscript approval. CV: analysis and interpretation of data, manuscript approval. MF: conception and design of the work, acquisition, analysis and interpretation of data, manuscript writing and final approval. Funding This study was partially funded by a CREA research grant of the KU Leuven (CREA/12/031), and a research grant by the European Crohn's and Colitis Organization (ZKC4621/10143459). MN and BV are doctoral fellows, and GVA, SV and MF are senior clinical investigators of the Research Foundation—Flanders (FWO). Competing interests SV: Grant support: AbbVie, MSD and Takeda; Speaker fees: AbbVie, MSD, Takeda, Ferring, Dr Falk Pharma, Hospira, Pfizer and Tillots; Consultancy: AbbVie, MSD, Takeda, Ferring, Genentech/Roche, Shire, Pfizer, Galapagos, Mundipharma, Hospira, Celgene, Second Genome and Janssen. GVA: Financial support for research: Abbvie, MSD; Lecture fees: Abbvie, Ferring, MSD, Janssen, Takeda; Consultancy: Abbvie, MSD, Takeda. MF: Research grant: Takeda; Speakers fee: Abbvie, Boehringer-Ingelheim, Chiesi, Falk, Ferring, Janssen, Mitsubishi Tanabe, MSD, Takeda, Tillotts, Zeria; Consultancy: Abbvie, Boehringer-Ingelheim, Ferring, Janssen, MSD. Ethics approval The study was approved of by the ethics committee of the University Hospitals Leuven, Belgium (ML7771).